I just finished reading Garlic and Sapphires, Ruth Reichl‘s account of being the NYT food critic (yeah, it’s been out forever but I’m late to a lot of stuff). I loved how she included recipes instead of photos, so you can make the food she’s talking about. There’s a point in the memoir where she is tiring of being the critic and assuming all these disguises, and she makes a vanilla cake with her young son Nicky and his friends. It sounded so good that my son and I just had to try it. (I swear, I drooled so much while I read this book. It was worse than seeing photos). 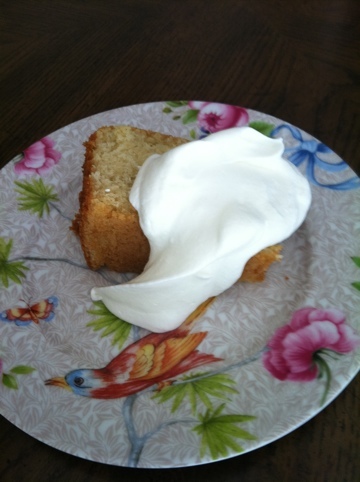 She calls it Nicky’s Vanilla Cake and because Nicky and his friends “creamed the sugar into butter, pounding fiercely with wooden spoons until they had achieved a perfectly smooth emulsion,” I had my son make it without the electric mixer, too. Just his arms and a wooden spoon. He got tired, but never complained. I told him his right arm would get super big. He did all the measuring and mixing himself. I helped him with the oven part. A bit…a lot…of homemade whipped cream went on top. Son was so proud of himself. He loves the show CAKE BOSS and immediately hatched a plan for his own bakery. (We all have jobs. 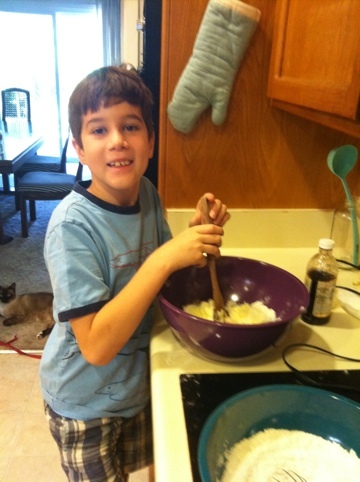 My title is “Oven Handler.”) And, of course, for baking more cakes by himself. After this one’s gone, we’re doing chocolate. Preheat the oven to 350 degrees. 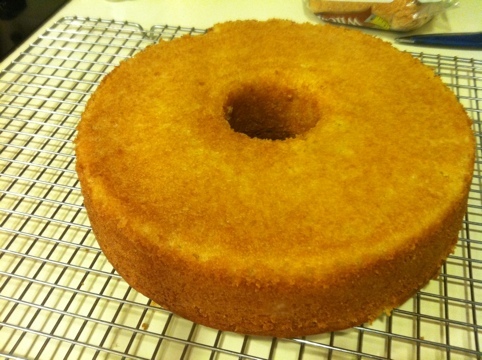 Butter and flour an angel-food or bundt cake pan. Cream the butter and sugar together until light and fluffy. Add the eggs, one at a time, blending well after each addition. Pour the batter into the prepared cake pan and bake for 40 to 45 minutes, or until golden. Let the pan cool on a wire rack for 5 minutes. Then turn the cake out of the pan, and leave it on the rack until cool.